With Super Bowl 50 coming up this weekend we decided to make Super Bowl themed puppy chow! 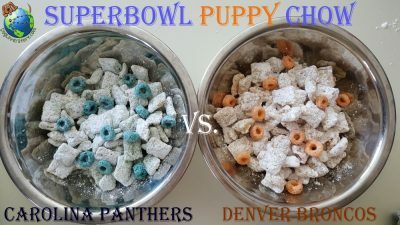 Puppy chow is the perfect dessert to serve after you “chow” down all those chips, dips, and wings during the game. Puppy chow is easy to make and easy to eat. It’s finger food – perfect for game day! And why puppy chow, do you ask? Well, we are dog lovers of course! So we are game for anything that is dog themed. The Denver Broncos are facing the Carolina Panthers in Super Bowl 50, which takes place on Sunday February 7th at 6:30 pm EST. 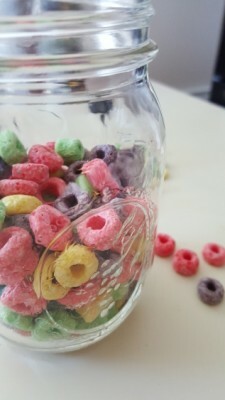 To give a twist on a recipe we found, we decided to add fruit loops to the mix which gives a yummy taste and fun pop of color to represent each football team’s colors! 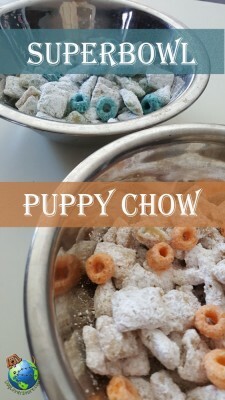 We based our recipe off of an easy and delicious Cupcake Puppy Chow recipe from Sally’s Baking Addiction. Take a look at our twist on the recipe below. Measure out the cereal and pour into a bowl large enough to toss the cereal in. Place the chocolate and cream in a saucepan over medium-low heat. Stir until the white chocolate is fully melted. Remove from heat and stir in the extracts. Immediately pour the chocolate mixture over the Chex cereal. Gently mix the Chex mix with the chocolate mixture. The key word here is gently because the cereal will start to crumble. In a covered container, add the powdered sugar and crushed fruit loops. We wanted to make our puppy chow color themed so we split the powdered sugar in half. We added the crushed orange fruit loops to one half and the blue fruit loops to the other half. 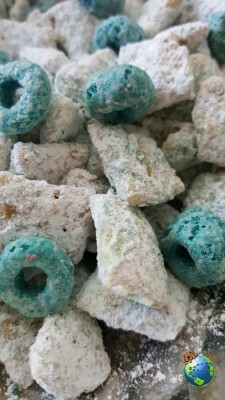 Then we put the chocolate covered cereal into the container with the blue fruit loops and powdered sugar and tossed it around. We repeated these steps with the orange fruit loops. 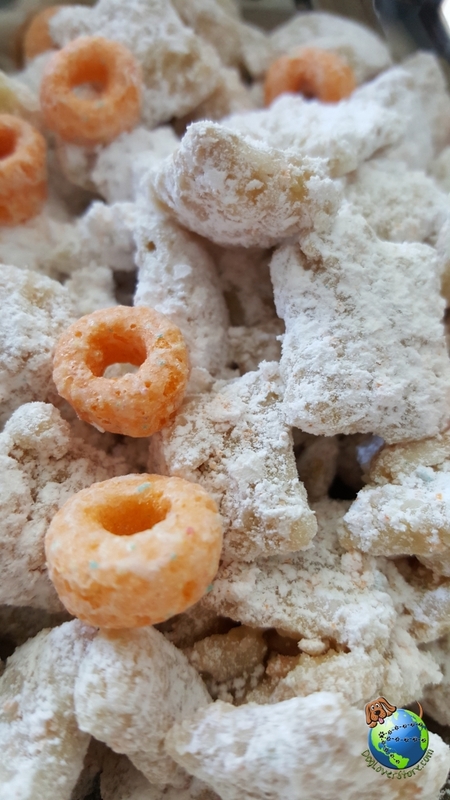 The cereal will be fully covered in the powdered sugar mixture. Throw away excess powdered sugar and consume within a couple days. The blue fruit loops represent the Carolina Panthers and the orange fruit loops represent the Denver Broncos. Who are you rooting for in Super Bowl 50?